A volunteer nurse forms a bond with a soldier afflicted with an inexplicable sleeping condition. At times, all this shapelessness, both in style and story, risks coming across as lazy or underdeveloped; but if we allow ourselves to let Weerasethakul lead us in his gentle visual meditation, we can see how successful Cemetery of Splendour is as a cinematic experience. Apichatpong Weerasethakul, Thailand’s most internationally prominent filmmaker, adds another dreamily experimental entry to his oeuvre with his new film, Cemetery of Splendour. With Cemetery of Splendour, the director who helmed Tropical Malady (2004), Syndromes and a Century (2006), and, most notably, Uncle Boonmee Who Can Recall His Past Lives (2010), continues to explore his distinctive style that turns filmmaking conventions inside out. Ultimately, Cemetery of Splendour is a beautifully perplexing film, patient in its experimentation and moving in its sense of gentle wonder. In some ways, Cemetery of Splendour maintains a more cohesive narrative than some of Weerasethakul’s past work. In a suburb in northern Thailand, a small makeshift hospital has been established for a group of soldiers, all of whom suffer from a mysterious illness that puts them in coma-like states of slumber. Jenjira (Jenjira Pongpas), a pleasant woman, older but not yet old with a leg length discrepancy of 10 centimeters, comes to the hospital (formerly a school she attended as a child) to volunteer. While volunteering, she forms a bond with the sleeping Itt, a soldier who has no one to visit him. Jenjira (or Jen as she’s often called) and Itt establish a mother-son rapport as the soldier unpredictably falls in and out of his mysterious sleep. In Cemetery of Splendour, Weerasethakul manages to create a palpable sense of dreamy magic in the simplest of ways. There are none of Lynch’s dancing midgets, none of Carax’s talking limousines - just a basic mysticism that’s matter-of-fact in its presentation. At one point, Jen goes with her strangely absent American husband to a Buddhist temple to pray to two statues of ancient princesses. Later, while Jen is eating lunch, two women who identify themselves as the princesses sit and talk with Jen. No CGI transformation is seen; the two princesses simply walk into Weerasethakul’s characteristically off-centered composition. Jen unquestioningly believes that these women are the living, moving statues to whom she prayed, and the film shares her good-natured credulity. In an extended sequence, Jen follows a clairvoyant who maintains to be a conduit for Itt through the woods. Jen accepts that the clairvoyant is Itt, and after a few minutes of their extended excursion, we do as well. In moments like these, the film manufactures a compellingly heady atmosphere from its complete acceptance that this mystical sort of magic occurs regularly. 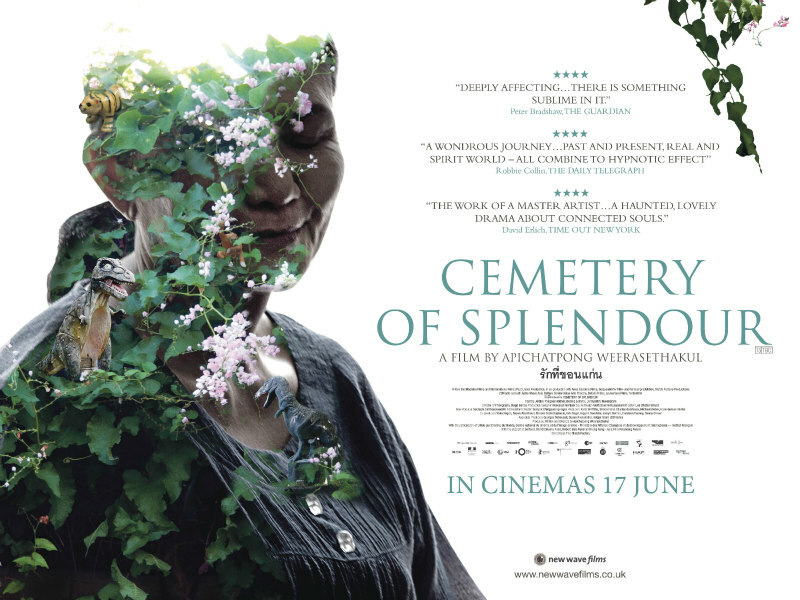 Cemetery of Splendour coaxes the viewer, without any sort of spiritual or moral agenda, into believing unseen, unproven magic. This sense of belief consequently encourages the viewer to meditate on the film’s idea of invisible forces - forces that don’t govern in the world of Cemetery of Splendour as much as they coexist with the film’s loose sense of reality. As the succession of phantasmagoric events progresses, the film’s sense of mystic wonder feels more and more profound. This amorphous quality of representing events carries over into Cemetery of Splendour’s style as well. The shots may often feel askew or barely organised, yet the film’s style offers a soothing beauty in its casual, accepting way of seeing the world - or even different kinds of worlds. 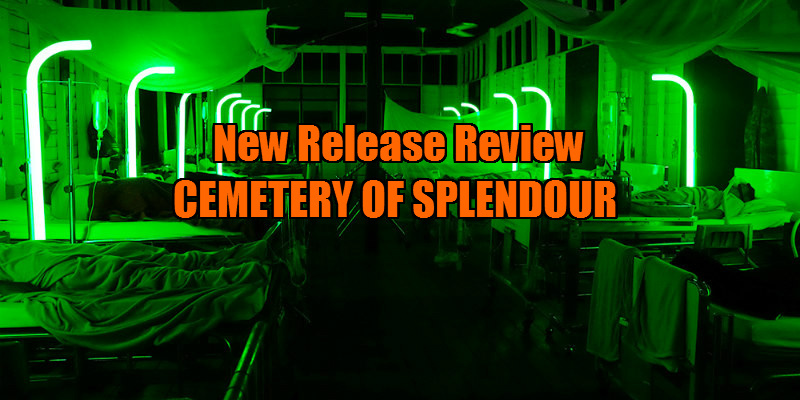 The images from the film that perfectly represent the film’s aesthetic as a whole are the sleep-aid lights that medical technicians install in the hospital to give the soldiers good dreams: like Cemetery of Splendour itself, these lights lack symmetry and curve randomly; yet the slowly changing hue of the lights’ glow radiates the same soothing beauty. At times, all this shapelessness, both in style and story, risks coming across as lazy or underdeveloped; but if we allow ourselves to let Weerasethakul lead us in his gentle visual meditation, we can see how successful Cemetery of Splendour is as a cinematic experience. If you’re interested in watching Cemetery of Splendour, but are reluctant to endure its occasional incomprehensibility, I suggest you approach it as a sort of Buddhist buddy film. Jen and Itt do form an unlikely friendship in a way that feels like familiar mainstream filmmaking, and the emotional effect can be quite powerful. Jen’s lonely innocence and storied past combined with Itt’s sleeping illness make them ideal, if idiosyncratic, partners for one another. As the surreal, wandering events unfold, think of Jen and Itt’s mutually therapeutic friendship as the film’s anchor dropped in the murky sea of the film’s atmosphere - a sea that, to quote Itt’s journal “can be violent or still with no pattern.” And after the film’s two hours have passed, you will have internalised the mysterious therapy of their friendship as well.